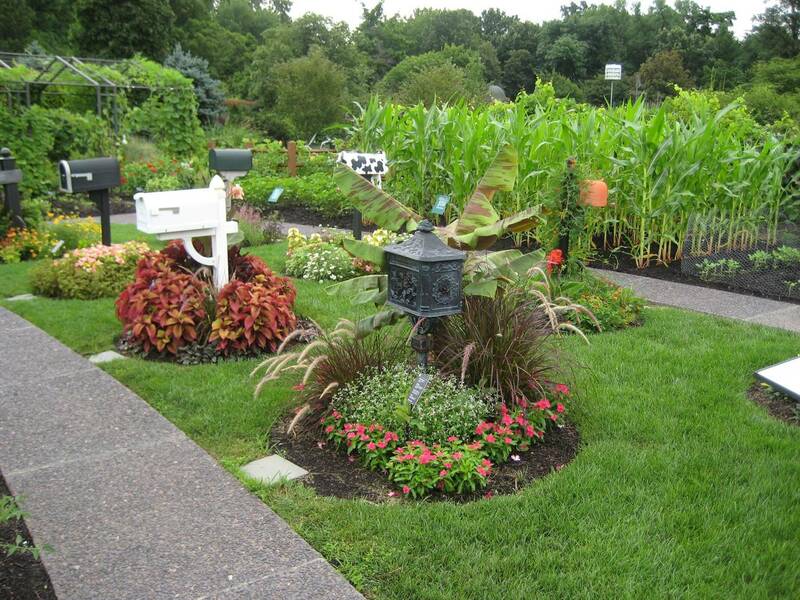 This article will cover the basics types of garden beds and plant layout. 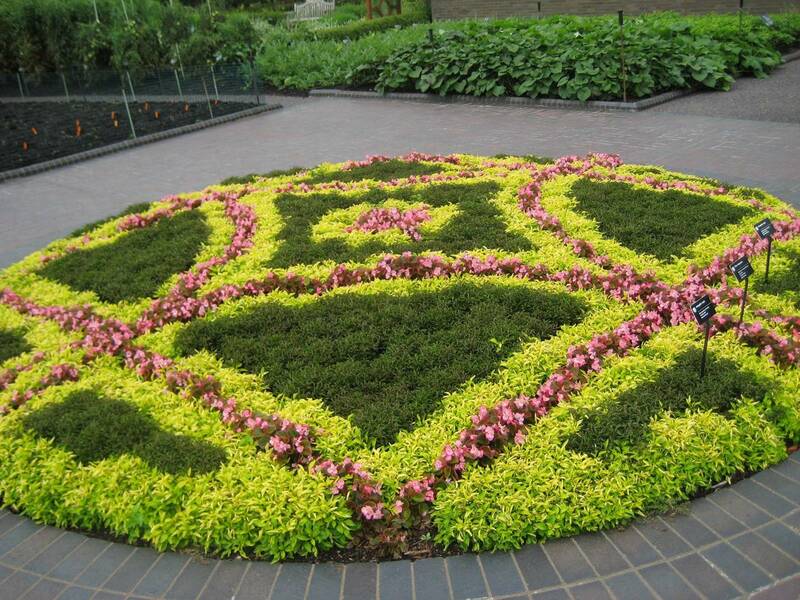 Gardens should always be considered highly personal works of art. As in any kind of art, taste will vary greatly with every person having a different opinion of what constitutes beauty. I think understanding basic design principles, is important for two reasons. First, if you know the rules you can break them in an intelligent way. Second, it helps give you a comfort level that what you design won't be a complete disaster. However, in the end the only thing that really matters is that you love your garden - your opinion is the most important one. There are two basic types of garden beds; island beds and borders and two basic styles of gardens; formal and informal. We will start by covering the two types of beds and then move onto the two styles. A border is anchored by a backdrop and I think these beds are easier to visualize than island beds, at least for me, since the background will help define the size of your new bed. The backdrop might be a house, a hedge row, a fence, or anything else that gives you a fairly solid background. Borders are viewed from only one side. A flower border is generally, but not always, long and narrow. How deep your bed needs to be will partially depend on how long the bed is. The proportions of the bed are important. A short bed doesn't need to be as deep, a 3 foot by 8 foot bed will look right at home. A longer bed will need more depth, if possible. A 12 foot by 100 foot bed will look proportional. The photo on the left shows a narrow border at the Missouri Botanic Garden, in the center is a border along my front porch, and on the right is a great orange-toned border. Island beds, on the other hand, are not anchored by a backdrop and can be viewed from all sides. They often have a center anchor. This anchor isn't necessarily right in the middle. It can be offset to one side for an asymmetrical look. Center anchors can be anything from a tree, shrub or large perennial to a piece of statuary or a large container, even a bench or trellis/arbor can work as a center anchor. The photo on the left shows an island bed with a tree as the anchor, the structure on the right is open so you can see this bed from all sides. The photo was taken at the Boerner Botanic Garden in Hales Corner, Wisconsin; a great garden if you get a chance to visit. In the center is a butterfly wing shaped bed taken at the University of Michigan Children's Garden. The photo on the right shows a series of small island beds that use mailboxes as their anchor. The photo was taken at the Missouri Botanic Garden. In general, plants in borders are arranged with tall plants (taller than 2 to 3 feet) placed in the back, mid-size plants (10 inches to 2 to 3 feet tall) in the middle, and short plants (less than 10 inches) in the front of the bed. It is best to use groupings or drifts of plants for a natural feel. Look at the border planting plan below. Tall plants are in brown, medium-tall plants are in blue, medium-short plants are in teal, and short plants are in dark green. Note that the plants are grouped rather than in rows. The other thing to consider when planning your plant placement is that it is often best to use groupings of at least 3 of the same plant together. One plant alone often does not have enough impact, where a grouping of 3, 5, 7 or more will have good impact. Odd numbers tend to look better than even numbers. This is especially true of smaller plants where groups are necessary to have impact. 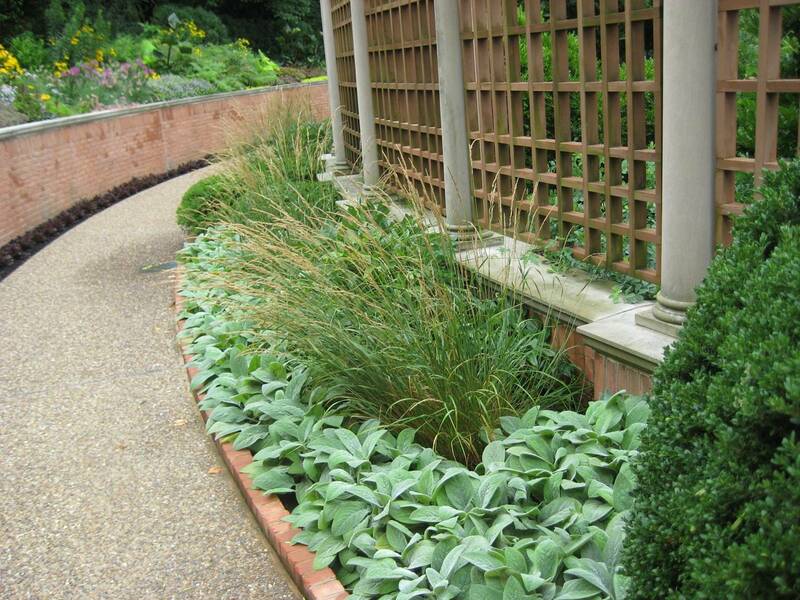 Short plants can be used in long narrow plantings to create borders on the edge of a bed. There is an exception to the plant 3 or more plants rule. In general, if a plant is large enough, think shrubs or large perennials, it can hold it's own without being grouped with other plants. Usually, only back of the border plants can stand alone. Scroll back up to see photos of borders. You will note that the plants are grouped in drifts with the taller plants in the middle of the bed and then getting progressively shorter as you get toward the edge. Your design doesn't need to be rigid, you can see above that some medium sized plants come to the edge of the bed and some short plants are right next to tall plants. The tall to short progression is simply a rule of thumb, not a hard and fast rule. Scroll back up to see photos of island beds. 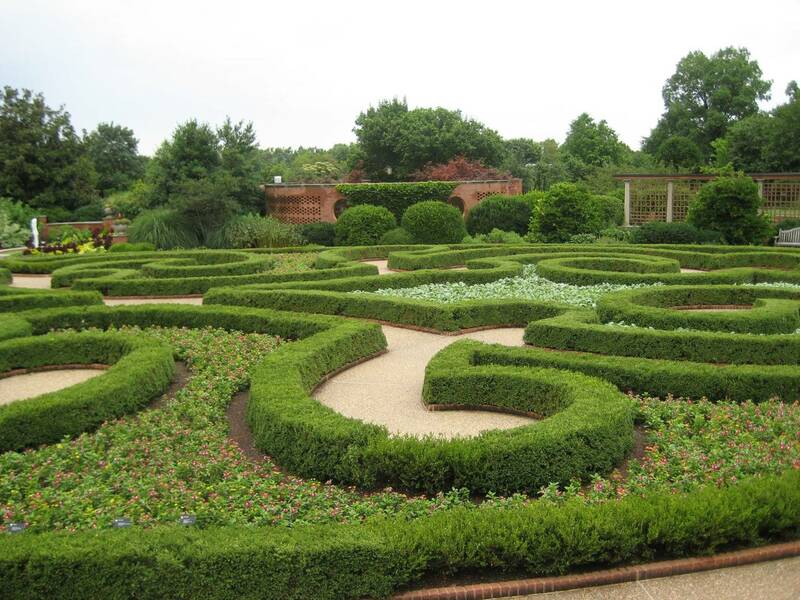 On the left is a circle knot garden, in the center is a formal garden with lots of color, but very geometric shapes, and on the right is a formal garden with a clipped boxwood hedge to create the form of the beds. All of these photos were taken at the Missouri Botanic Garden. 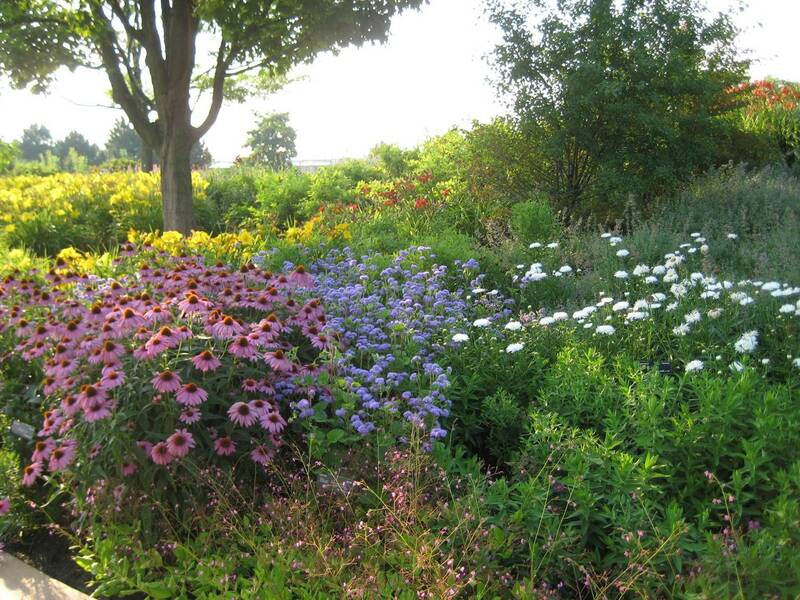 The photo on the left is from the Ball Seed Company garden in West Chicago, Illinois and shows, more or less, a wildflower meadow. 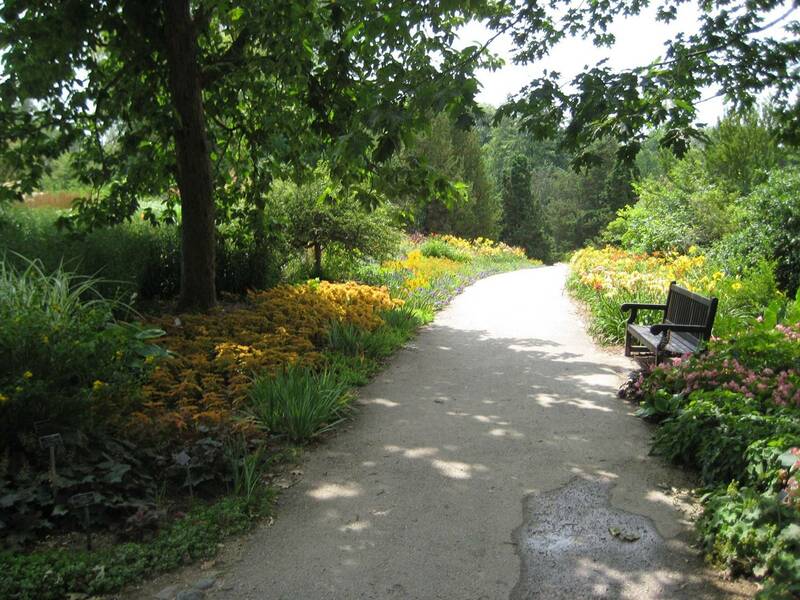 The center photo is from the Boerner Botanic Garden and shows a curving walkway bordered by colorful plantings. 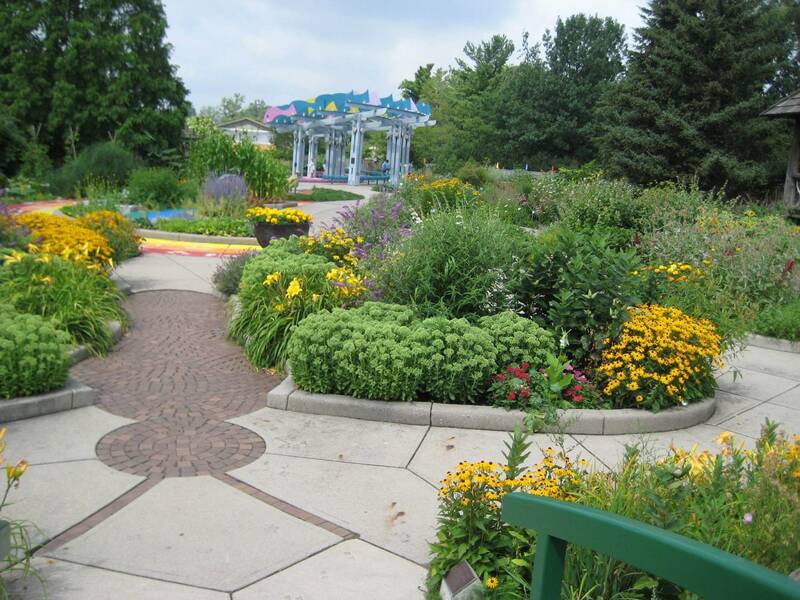 The photo on the right is from The Champaign County (Illinois) Master Gardener Demonstration Garden and shows a great informal garden using bright colors. Learning the types and styles of gardens and the general principles of plant placement will help you design gardens for your own home. 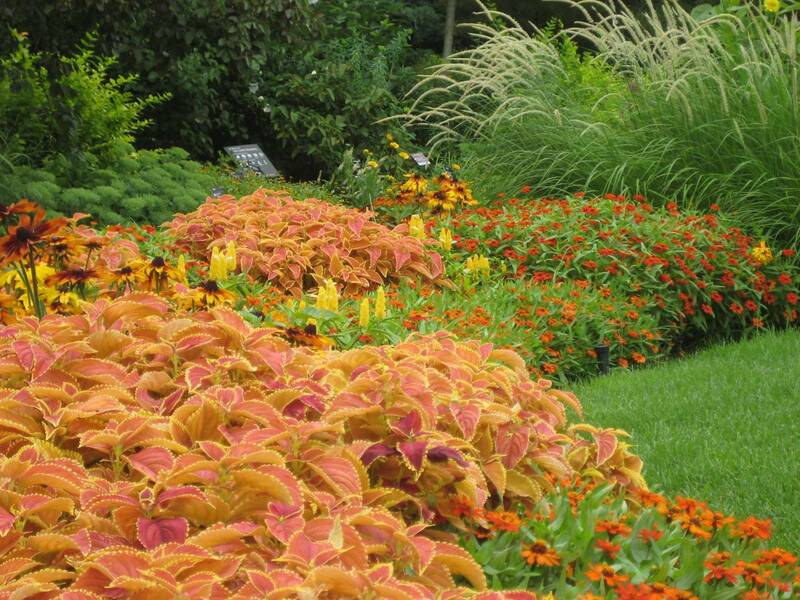 To learn about using color in your garden click here. Of course, once you design a bed you have to actually dig and prepare it. For more information on actually preparing your bed for planting, click here. *Planting plans developed by the University of Missouri Cooperative Extension Master Gardener program. 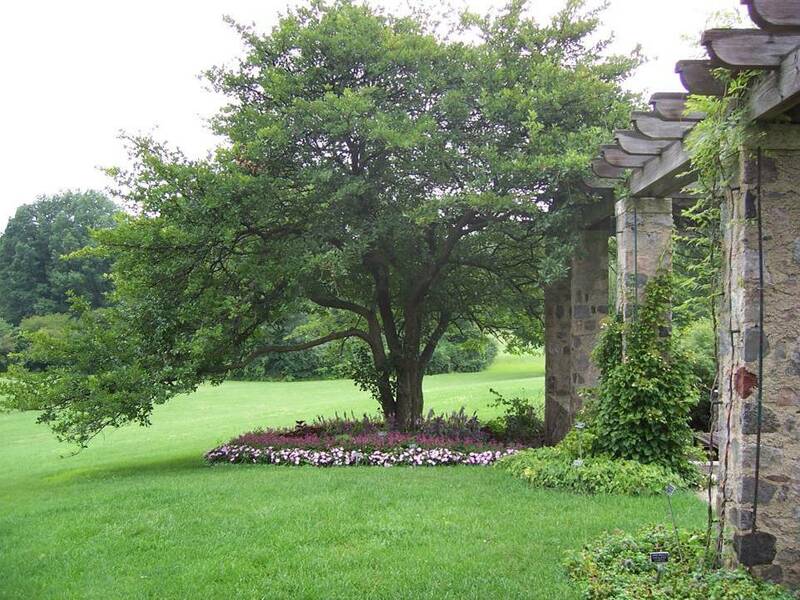 This was a very nice overview article on garden design. The example photos were lovely and inspiring, too! This is a very good article. Easy to follow and understand. Thank you....I want to visit Missouri! 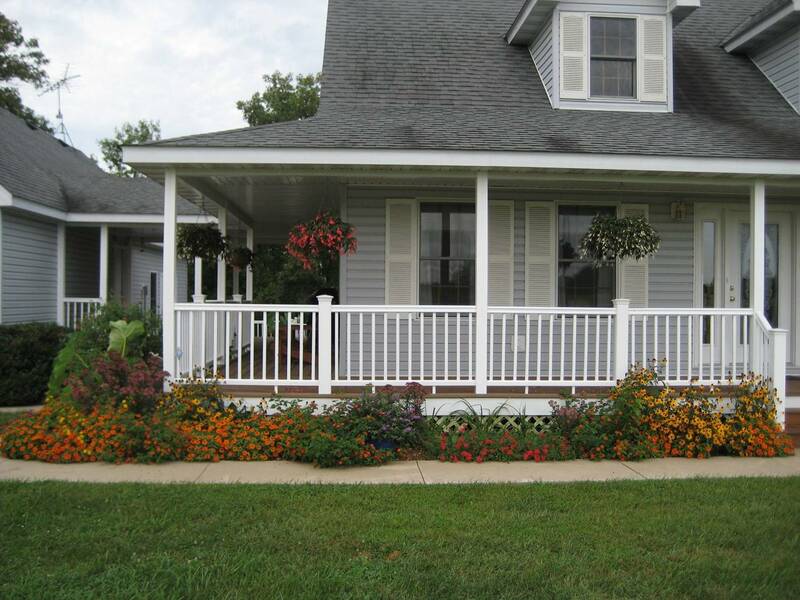 Can you tell me what plants are in front of your porch? I really love the colors and combo. Love orange tones in the landscape. 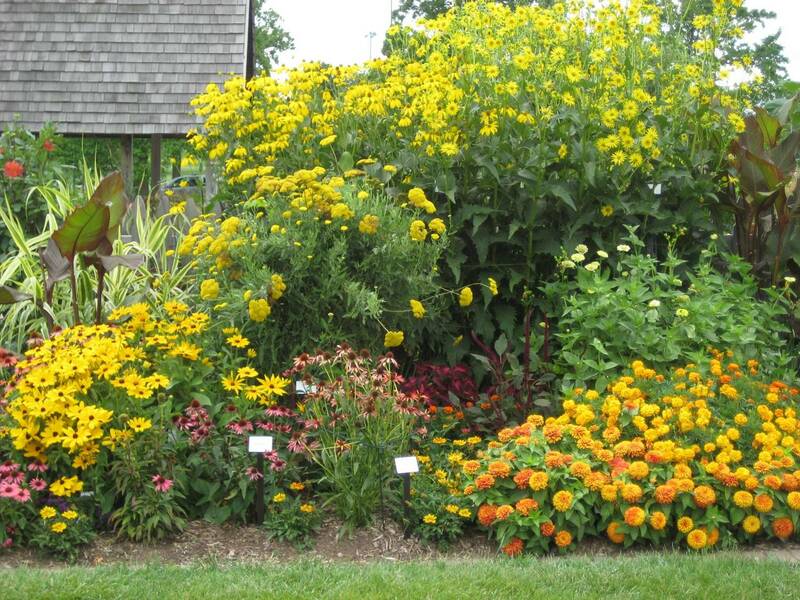 That bed has Profusion Orange zinnias, Lantana Luscious Citrus Blend and Rudbeckia Goldsturm and then for fall color Sedum Neon. it's a pretty simple combo with orange/yellow/red. I am interested in the plants you used in cicrle design layout. 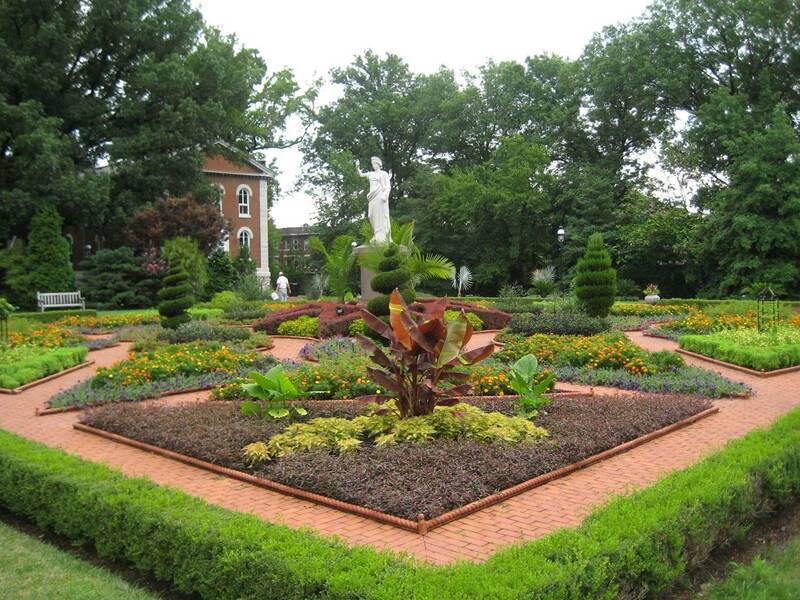 Unfortunately, that was a photo I snapped at the Missouri Botanic Garden years ago and I don't know what plants were utlized in that bed. I would guess that the pink flowers are one of the compact bedding begonias, other than that, I'm afraid, I simply don't know.